How one couple are working with ActionAid to improve children’s lives in rural Nepal. After visiting the child that they sponsor, Trish and Gerry Kerr are fundraising for Nepal. In April 2016, Gerry and Trish Kerr from Kildare travelled to the remote area of to Bardiya in Western Nepal to visit their sponsored child. 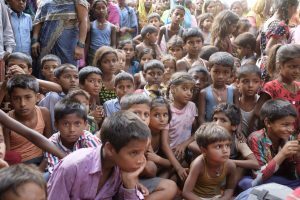 Not only did they meet Sujit and his family – they stayed for three days in the village as guests of the community. Overwhelmed by the welcome they received, the Kerr’s returned home determined to continue their support of ActionAid. They have chosen to fundraise for two essential projects – projects that will deliver a brighter future for the young people of the village. Around a third of Nepal’s people live below the poverty line and in rural areas women need to earn additional income from outside the home to sustain their families. A community childcare centre would not only provide a centre of early learning development for children and but would also support local women to develop sustainable income and livelihoods projects. The project has been fully assessed by our partner organisation ActionAid Nepal and it will cost €8,240 to deliver. Please tick if you would like to hear from us. Trish and Gerry are also fundraising to build two additional classrooms in the local school. Your support of these community projects would be hugely appreciated by Gerry and Trish Kerr and by all the team at ActionAid.